­­­­­­­­­­­­­­­­ Are you fluent in another language other than your own? Do you also enjoy transcribing documents, videos or recorded phone calls? Would you like to be able to do both of these and still work from home? Then Telelanguage might be the right work-at-home situation for you. Telelanguage, a company founded in 1991 and based out of Portland, specializes in translation. They hire on-site employees, telecommuting employees, and remote employees. The remote employees are usually either transcribers/translators or remote phone agents (do not have to be bi-lingual) who use the phone portal to connect translators and customers. Not all translators will also be transcribers, but all transcribers will need to also be translators in their language. Telelanguage has 2,000 interpreters in over 250 languages available around the clock 24/7 365 days a year. For this article, we will be discussing the remote transcriptionist/translation position. This would be the remote individual who would accept the recording of the telephone call and need to translate the conversation via transcription that took place between the interpreter and the other parties. Sometimes transcription/translations also come from remote videos as well. What Are the Benefits of Working At Telelanguage? It appears that they mainly only hire individuals as employees and not as independent contractors. Which Industries Does Telelanguage Serve? 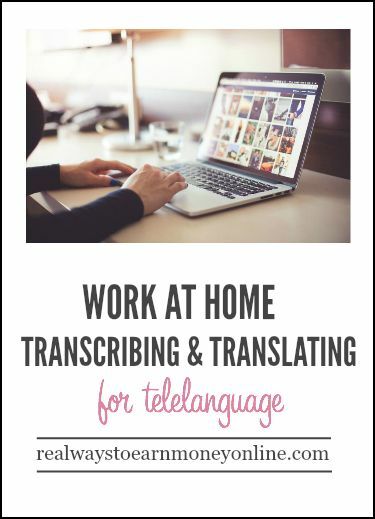 What Are the Requirements to Work As a Transcriptionist/Translator at Telelanguage? The first five requirements will be reviewed on a case by case basis. How is Pay Handled at Telelanguage? Because so much of this position is reviewed on a case by case basis, the pay will vary. However, it appears to be in the $14 to $20 range. What Type of Training Does Telelanguage Offer the Transcriptionists/Translators? All transcriptionists and translators are thoroughly tested and participate in ongoing training and mentoring. Ethics and codes of conduct are also viewed on an ongoing basis. There is also the TIPC or The Telelanguage Interpreter Certification Program, which offers 120 hours of interpretation and role playing in several different settings. What Do Others Say About Telelanguage? Glassdoor gives them a 3.3 out of 5.0 star rating, but Indeed gives them a 3.7 out of 5.0 star rating. You can certainly read through them for yourself. Even though they say that they have interpreters from all over the world, it would be wise to see which other countries they hire in before applying or better yet—send them an email to see if your country may be included. How can an Interested Applicant Apply to Telelanguage? There are actually two ways to apply. You may go to the Careers navigation button on their website or go to Indeed. Now, if you go to Indeed, you will need to type in the word Telelanguage in the keyword field and the word Remote in the location field. P.S. – Looking for other work at home transcription/translation jobs? FlexJobs frequently has these types of positions posted. It's a subscription-based job board with guaranteed scam-free job leads. Leisa, thank you for this posting, but appears position is no longer available, bummer. Keep checking on Indeed. They go fast. They also have call center and other jobs. Just type in Telelanguage without quotes and then Remote in the location. They pop up all the time as the company grows. However, they do go fast, because it seems to be a good company. Thanks for sharing this opportunity with Telelanguage with us Leisa. I’ll be sharing this one for sure!